Go to original pattern for design DROPS 130-25. Knitted DROPS shawl with long sts in ”Alpaca Bouclé”. 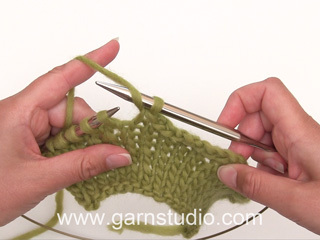 DROPS CIRCULAR NEEDLES size 5 mm / US 8 (80 cm / 32'') - or size needed to get 17 sts x 32 rows in garter st = 10 x 10 cm / 4'' x 4''. 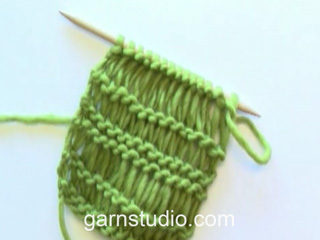 You can get the yarn to make this pattern from	26.00$. Read more. 1st row (= RS): * K 1, 2 YO *, repeat from *-* until 1 st remains and finish with K 1. 2nd row (= WS): K while slipping the YOs from previous row off the needle (= long sts). NOTE! Remember the inc.
3rd row: As 1st row. 4th row: As 2nd row. 5th row: As 1st row. 6th row: As 2nd row. 7th to 12th row: K all sts. Repeat row 1 to 12. The shawl is worked top down. The shawl is worked back and forth on circular needle to make room for all the sts. Cast on 3 sts on needle size 5 mm / US 8 with Alpaca Bouclé. Insert a marker in the middle st = mid back of shawl. All measurements are done straight down in the middle of the piece. Work 1st row (= WS) as follows: K 1, 1 YO, K 1, 1 YO, K 1 = 5 sts. K back over all sts, knit the YOs twisted (i.e. work in back loop of st instead of front) to avoid holes. Work next row as follows: (K 1, P 1) in first st, K 1, (K 1, P 1, K 1) in next st, (K 1, P 1) in next st, K 1 = 9 sts. K back over all sts as before. Continue to K back and forth over all sts. AT THE SAME TIME inc 4 sts on every row from WS by working (K 1, P 1) in the first st on row and in the next to last st on row, and by working (K 1, P 1, K 1) in the middle st with marker. Continue like this until there are 57 sts on the needle. Now inc 6 sts on every row from WS by working (K 1, P 1, K 1) in the first st on row, the middle st with marker and the last st on the row AT THE SAME TIME on next row from RS start with PATTERN - see explanation above. Continue with pattern until piece measures approx. 58 cm / 22 3/4'' measured mid back (finish after 6th row in pattern). 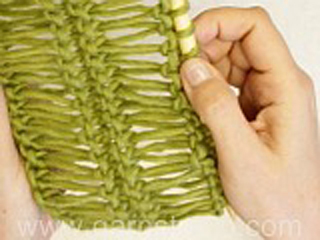 Now continue with inc on every row from WS as before while AT THE SAME TIME knitting back and forth over all sts. Continue like this until piece measures 62 cm / 24½'' mid back. 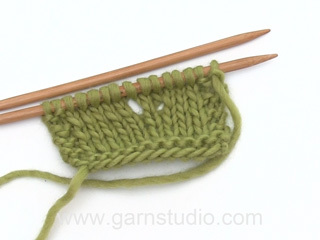 Now bind off as follows: * bind off 3 sts, make 1 YO on right needle, bind off YO *, repeat from *-* the entire row. Buongiorno Monica. Il Paris, pur essendo dello stesso gruppo filati di Alpaca Bouclé, potrebbe risultare pesante. Sempre dello stesso gruppo di filati potrebbe usare il Bomull Lin, un filato misto lino cotone, che una volta lavato risulta molto leggero e morbido. Per un aiuto più completo può rivolgersi al suo rivenditore Drops di fiducia. Buon lavoro! Liebe Margit, nachdem Sie 9 M haben, sollen Sie 4 M in jeder Rückreihe zunehmen (= (1 re., 1 li.) in die erste und die letzte M und (1 re., 1 li., 1 re.) in die mittlere M. = 1 M auf beiden Seiten + 2 M in der Mitte ) bis Sie 57 haben. Dann wird es in jeder Rückreihe 6 M zugenomen (= je (1 re., 1 li., 1 re.) in die erste, die mittlere und letzte M. dh 2 M auf beiden Seiten + 2 M in der Mitte), und dann gleichzeitig Muster anfangen. Viel Spaß beim stricken! Hallo, ik begrijp niet hoe ik moet beginnen aan de omslagdoek. Er staat dat je begint met 3 steken opzetten maar bij naald 1 worden er 5 steken genoemd. Hoe kan dit? & wat wordt er bedoeld met: Brei de volgende naald als volgt (1 st r, 1 st av) in de eerste st. Is hier ook een video van? Alvast dank voor het antwoord. Miten jatkan, kun kysymystä ei hyväksytä ja näyttöön tulee: Kommenttiisi sisältyy linkki tai kielletty sana! Vu le nombre de pelotes prévues c'est une erreur que d'arrêter le point fantaie aprs 58 cm. With over 30 years in knitting and crochet design, DROPS Design offers one of the most extensive collections of free patterns on the internet - translated to 17 languages. 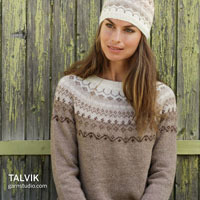 As of today we count 242 catalogs and 8808 patterns - 7788 of which are translated into English (US/in).